Apart from our main equipment we also offers a high quality of equipment which are used for different sector of industries like universal testing machine. 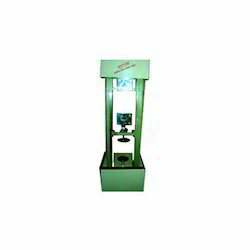 Universal Testing Machine 1Ton to 5Ton finds its application across industries to determine the quality of the finished products. It can take varying weights of samples and an automated process determines fast testing. The results are displayed via digital outlet for zero error readings. The thread heads are motor driven for quick cross head adjustment. The product can be changed with ease to suit the requirements. Loading accuracy as high as ± 1%. Straining at variable speeds to suit a range of materials. Motor-driven threaded columns for quick and convenient adjustment of lower cross-head to facilitate rapid fixing of test specimen. Continuous roll auto graphic recorder supplied as standard to enable study of the behavior of materials. High reading accuracy due to large size design of dial.